Gyrfalcons living in the high Arctic overwinter out at sea, spending long periods living and hunting on pack ice. 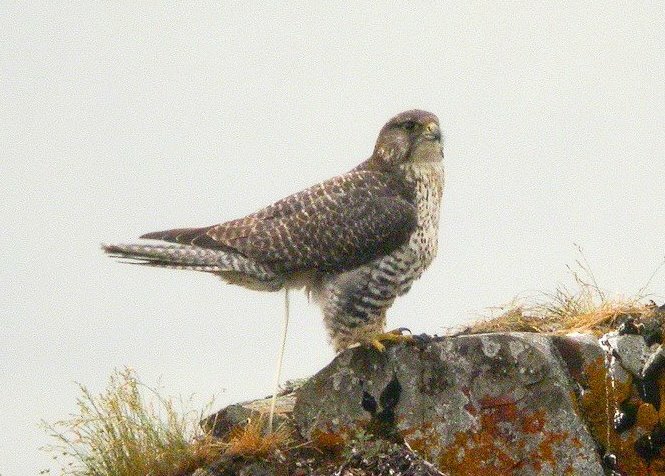 It is the first time any falcon species has been found regularly living at sea. The birds likely rest on the ice and hunt other seabirds such as gulls and guillemots, over what appears to be one of the largest winter ranges yet documented for any raptor. "I was very surprised by this finding," said ornithologist Kurt Burnham who made the discovery. "These birds are not moving between land masses, but actually using the ice floes or pack ice as winter habitat for extended periods of time." Pack ice is already known to be crucial habitat for other Arctic species, notably Polar Bear and Walrus. Now you can add Gyrfalcon to the list of charismatic species – perhaps the least expected – that depend on pack ice for at least part of the year.